Do you want your baby to sleep longer through the night? This post outlines ways to get your baby to sleep through the night. 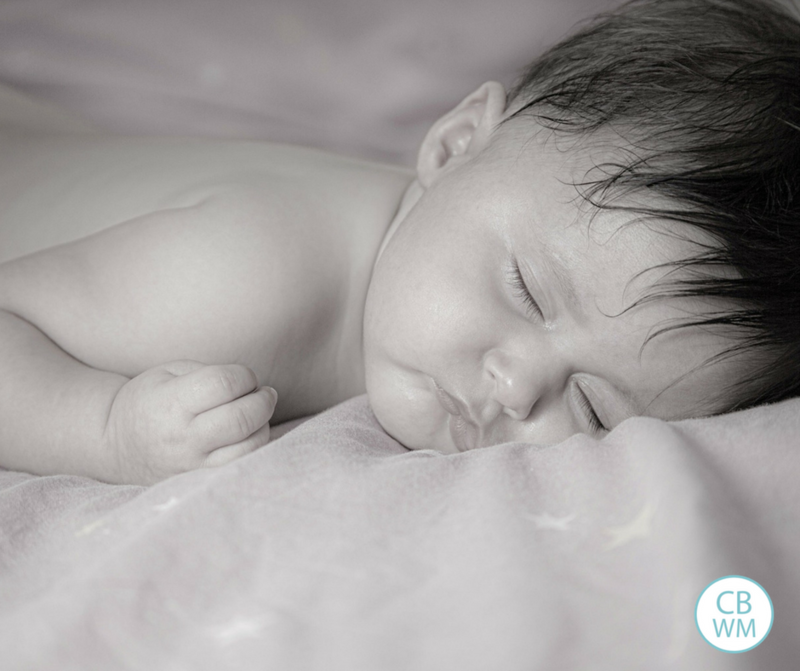 How to help your baby sleep through the night and stop waking up in the 5-6 am hour. A really difficult time to navigate is the time when your baby starts to wake in the night around 5-6 AM. Most babies will land here for some period of time as they extend their night sleep. What was once a clear night waking around 2-3 AM extends to the 5-6 AM hour, leaving many parents wondering what to do. Do you count that as a night feeding? The first morning feeding? What do I do? How long will this last? How long will this night waking last? Of course it is impossible to say! Of my four children, all of them did this for some length of time. The time has ranged from mere days to weeks. I don’t have a way to predict it for you. No matter how long it is, you will want a strategy of what to do when it happens. Please note, it is very important that you start your day at a consistent time. Babywise heavily stresses starting your day consistently–it states to not underestimate the importance of this for reaching your sleeping through the night goals. You can always change what your desired waketime is (if you are able–people who work or have children in school are more confined to a range). So your first goal may have been 7 AM, but you move it back to 8 AM (I have done this). That is okay. Whatever time it is, be consistent. What you don’t want to do is feed at 6 AM and then let baby sleep until whenever. Let’s talk strategies to stop these night wakings. 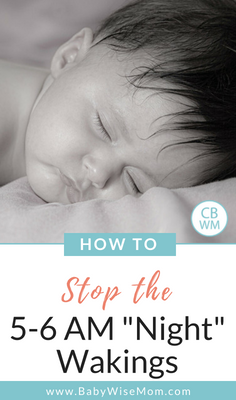 Below are five different strategies to stop the night wakings and get baby sleeping through the night. Strategy 1: Treat like a night feeding. The first thing I do when this starts is treat it like a night feeding. I feed at that 5-6 AM time, then put baby straight back down. When I feed baby at that time, I act just as I do in the night (minimal socializing–I don’t want to establish night feedings as a social call). I keep the baby swaddled up and put her right back down when she is done. Then what? Then I get baby up as close to our desired waketime as possible. So if our goal is 7:30 AM, I will stick to the “30 minute window” rule and get baby up at 8 AM and do an official first feed with morning waketime and all of the socializing we want. Then we adjust our schedule throughout the day to get back on our exact desired feeding times. I like to adjust it over the course of the day so that bedtime stays consistent. Sometimes I keep things 30 minutes off until the early evening because baby often will eat sooner at that time of day more eagerly than around lunch. You will know this is the best strategy for your baby if your baby still eats that first feeding of the day. Brayden was like this. He would eat at that 5-6 AM hour and then still eat for his first feeding as though he hadn’t eaten all night. Because of that, I was confident his body needed to eat at both times. We just stuck with this method until he suddenly started sleeping past that feeding and making it to his 7 AM start time. I am a big proponent of weaning from things. I find it works well for my personality and is a gentle and easy method for the baby. This is the method I used with Kaitlyn. This works well if you are in a situation where you don’t want a crying baby to wake up a sibling or your spouse (or neighbor). Since I breastfeed, this is how I did it once she stopped eating well for her first feeding of the day. When she woke in the 5-6 AM hour, I breastfed her as normal. Her average eating time was 10 minutes per side at the time. As time went on, I cut back to 7 minutes on one side, then five, then I did the same for the other side. Then I cut out one side completely. She then started sleeping through. A big bonus for the breastfeeding mom is that your body slowly adjusts your milk so you don’t wake up totally engorged. I believe the entire process took about two weeks. If you bottlefeed, you could reduce the number of total ounces over time. Another idea you can try is to slowly delay what time this feeding happens. If you do this, you will be treating the 5-6 AM feeding like a first feeding of the day. Say your baby is waking around 6 AM and your desired waketime is 7 AM. In this case, you wouldn’t really want to feed, then feed 1.5 hours later. 1.5 hours would not be long enough for baby to be hungry. You could decide you would rather an 8 AM waketime and go for that, but you might also really prefer 7 AM for some reason. You can distract baby for a short time before feeding. You can give the baby a pacifier, hold baby, change baby’s diaper, etc. The idea here is to wait about 10 minutes and then feed baby. Your hope is to get baby used to eating a bit later and then therefore sleep a bit later after a few days. This doesn’t always work, so I would give it 3-7 days before trying something new if this is your preference. You can try to get baby to go back to sleep. You can do this with a pacifier, by rocking, by patting baby, by putting baby in a swing, etc. If baby won’t fall asleep, feed baby. If baby does fall asleep, she will likely only sleep for 30-60 minutes before waking again. Sometimes that is all you need to get baby closer to your desired waketime. Just like the delay method listed above, this hope of doing this is that baby will get used to eating later and the metabolism will adjust so that baby will sleep later on her own. When it is close to your starting time, you might just treat it like your first feeding. So say you want to start at 7:30, but your baby is awake at 6:30. You just feed her, then play, then put her down for a nap. From here, you can let her go longer between this feed and the next to get back on track. So say she usually feeds again at 10:30 and then 1:30. You could get her up at 10:00 AM, then 1:30. Then you are back on track. I have even gone from the 6:30 to the 10:30 before if the baby is still asleep. If your baby is not old enough to drop a feeding and yet you like this strategy best, go ahead and feed more often in the day so you get an extra feeding in the day. For example, you might be down to a 2.5 hour schedule instead of a 3 hour schedule. I list this last because it is the last method I would try, and I actually haven’t ever gotten to this point. My other strategies have fixed it fast enough for me. I want to be positive the baby doesn’t need to eat at that time in the night before trying to force it to be dropped. If you are sure the baby is not hungry at the time she is waking, you might want to try cry it out (CIO). Only do so if you have through it through and are sure it is the right move. There is no benefit to CIO if you are going to do it then stop, then do it then stop. There is no benefit if you won’t be consistent about it. There is no benefit if the baby is waking from hunger. If the baby is not waking from hunger, there are many people who have used this with success. It is typically a faster solution–taking a few days only in most cases. If you do decide to do CIO, start, and suspect it was actually not the right strategy, it is absolutely okay to stop and try a different strategy. Be as sure as you can before starting, but you are a human and as such are capable of making mistakes. You have no way of predicting the future. Sometimes as parents we make the wrong call–that’s normal. For more on this topic, see my post on How to Get Your Child to Sleep In Later in the Morning. I'm so glad you posted this! My son is 10 months old today and we are still struggling with this! I feel like I'm doing something wrong and that he shouldn't be doing this at his age, but I'm at a loss. I nurse him right before bed around 6:30pm and he is in bed by 7pm. He then wakes up around 5:30am. I have just been treating it as a night feed and put him straight to bed after he eats and he will sleep until 8am. There have also been rare occasions (such as last night) where he wakes around 3:30am hungry. He is a very hungry boy and comes from a very tall family, so he is actually the same size as a 2 year old. Because of this, I wonder if he is just not able to go longer at night without eating. I just wanted to know if you had any thoughts or input on this. Thank you! Jayme, I have an 8 month old who does the same thing! And I've been feeling the same way as you. I'm going to work on shortening his MOTN feeding(s) to see if that helps. He was sleeping 12 hrs straight from 4-6 months old so I'm just at a loss. What I did with my son was based off the clock. If he woke 2 hours or more before the preferred wake time, I would do exactly what you said. Treat it as a nighttime feed. He'd get a full feed and put right back down to sleep. If he woke less than about 1.5 hours, I generally did the same thing, only difference was, I only let him eat on one side. That way I didn't over fill him and we could still start our day at the same time. I would sometimes delay the start of the day (within a half hour) during that period too depending on what time he ate and how much he ate. That worked really well for us! Eventually he stopped waking at all at that time. I have no idea what age though (and he was born 3 months premature, so at this point I wouldn't be able to tell you if I remembered actualy or adjusted age anyways).If I suspected he wasn't hungry I would do the pacifier test. Since we used pacifiers I would give him a paci and if he sucked on that contentedly for a while, then I knew he wasn't hungry and then we would CIO. But only once he did the test to check for hunger. I don't know that I ever did that for that wake time, though. I think he just stopped waking on his own after a while. To Jayme & Jenn….I have a now 14 month old. He is a BIG baby and for several months he woke in that 5-6 am stretch. (By comparison, his 8 year old brother, STTN at 4 months old!). I pulled my hair out for weeks, trying to get him to drop that early morning feeding. I finally realized that he was truly hungry. Once his solids/daytime food intake became sufficient, he dropped that early morning feeding completely on his own. There was no magic trick I could do. It was just time. So hang in there! !On another note…he recently went through a spell of 5:30 am waking again for 5-7 days. This time it was teething! And yet again, it went away on its own and he sleeps til 7 am again. Sometimes it just takes "time" and not "us" to solve a baby "problem". :)Good luck! Hi!! When did your son drop then 5-6 am feed? My son is 10 months and it's been happening for the last 3/4 months. He goes to bed at 6/630 every night and typically wakes around 5/530 am. Today at 435!! But back to sleep. Thank you so much for posting this. My son has been off and on with waking up at 5 for his entire 8 month life. We are early risers in our home and so 6 is my desired wake time, so depending on how close to 5 or 6 it is I usually keep him up. If it is 5 on the dot or close to it then I usually play with him and just drop in a catnap a few hours before bedtime to make up for the tiredness. I do usually hold off on feeding him until six unless he absolutely can't stand it — he usually eats at 6, 10, 2 and 6 but his naps have never completely stabilized. Anyway, it is great to see your strategies and a relief that I am not alone! Katharine. Thank you! I am fighting tears of relief after reading your comments. I am looking forward to the day we overcome this, and you have given me hope that it may not be anything I'm doing wrong and we just have to wait it out. Thank you, thank you, thank you! This post came at a perfect time for our family! I have 6 month old twins who I would like to have a wakeup time of 7am. One of the girls wakes at 6 every morning! I've tried CIO with no success. I tried starting the day then, but it's too early and they don't nap well when our day starts at 6. I've tried feeding a snack which has gotten us to 6 instead of 5:30, but because I tandem feed and they have designated sides, I have to wake both girls (or go back to bed very lopsided). Today at 7 they weren't hungry. I think I'm going to continue giving them a snack, or weaning, but keep cutting the minutes. Hopefully we continue to get closer and closer to 7. I have my plan for the morning! So glad I read this before going to bed. Jayme that is a tall boy! I think it is possible he is just hungry. But also look at your time frame. He is going 11 hours without eating typically. So even though it is early, it isn't necessarily that there is something wrong. You might try doing a cat nap at 7, let him sleep 30 minutes, then feed him again and put him to bed for the night. Check out McKenna's summaries for your child's age range–she was still taking three naps a day around that age. So it might be that he is genuinely hungry by then and a later feeding/bedtime could help him make it to an hour that is better for you. Michelle thanks for sharing your ideas! Your blog is an answer to prayer!Question: what do you do when they wont go back to sleep after the 6AM feed?At 5 weeks old, my baby had mastered the once-a-night feeding: he would breastfeed at 7pm, 10pm , 3-4AM, and 7AM. Then, he went through a growth spurt.Now at 6.5 weeks old, he will breastfeed at 7pm, 10pm (it is now nearly impossible to wake him up for this feeding but we give it our best effort), 2-3AM, 5-6AM. We start our day at 7AM.The last few morning I've been trying the method of treating the 6AM feed as a night feed (no lights, no talking, etc), with the intent of putting him right back now and then feeding again at 7:30AM (and then just adjusting later in the day to get back on schedule). Problem is, he WONT sleep after the 6AM. He just fusses in his crib for an hour or so. As a result, I usually then just do the breakfast feed at 7AM and attempt "reset" for the day. However, by the end of the 7AM feeding he's now been awake for at least 90 minutes since his 6AM wake up…which leads us to a really bumpy/poor first nap of the day, as 90 minutes is too much awake time for him in the morning (I read the post on the importance of the first nap).Also, he does take a full feeding at the 6AM feed, as well as at the 7/7:30AM feed. I'm a first time mama, am late jumping on the Babywise band wagon and am so stressed trying to catch my 8-week old baby up to a schedule. I feel as though I took bits and pieces of contrasting viewpoints so my baby is now left confused and frustrated (and so am I!). I had some success last week at getting her on a schedule and realized she needed daytime sleep WAY MORE than I ever thought she did. Poor babes. This week, however, her nighttime sleep is very skewed and her naptimes are all spent with her crying when I put her down as well as waking early. She used to sleep at least 6 (sometimes 7-8 and one time, 11!) hours at night and now she's all over the place. Is this just as a result of us shifting to a schedule? Also, I think she got in the habit of eating on demand because I offered her the breast whenever she cried (unfortunately) without stopping to assess her cries. I'm starting to learn her cries a bit better but feel so flustered and unsure of my abilities as a mama. My questions are as follows:1) If I know she is capable of sleeping 6-7 hours at night without feeding, but she wakes up earlier than that (as early as 3-4 hours) in the night, do I feed her so as not to wake my husband? Will this enable bad habits for her if I succumb to her cries after just a 3-hour nighttime sleep? As a question inside this question (sorry!) with the dreamfeed, we tried it once and she woke just 3 hours afterward, where normally she would sleep uninterrupted for 7 hours. I know dreamfeeds don't work for every mama/baby but should I try it a few more times? We also shifted her bedtime from 10-11pm to 7pm because I hated having her up so late, but her witching hour was from 7:30-10ish. Since she has gone to bed around 7pm she seems to do okay sleeping right through her previous witching hour.2) In this feed-wake-sleep schedule, it appears we only have about 15-25 minutes of wake time before the next nap rolls around…how do I have time to go anywhere or do anything in that short time? (ie: grocery shop, errands, etc.) Especially since I'm 8 weeks late on this, I was running out after her feedings and taking her here and there but she would have meltdowns in stores almost every time. Do I just submit to the reality that we aren't going anywhere during this season? 3) I read on your blog that often times crying when put down for a nap or rising early is a result of them being overtired. However, if she spends 20-30 minutes during her naptime crying, do I still awake her at the 2 hour nap mark even if she's finally asleep? I don't want to let her go beyond a 3-hour schedule because I don't want to compromise my milk supply. Up until this point, I have been awaking her at the desired time hoping it will get her on my schedule, but I don't want to be cruel to her if she truly needs the sleep. Oh my gosh I'm stressing myself out just writing this because I realize that I'm so scattered and overwhelmed. I want to do what's best for my precious babes but right now I simply don't know what that is. What's your best advice for someone starting this thing a little late? Should I just give myself a little grace knowing it might take a few weeks for both of us to adjust? Hey Carleyverlene,I'm just another baby wise momma – not the expert! But I thought I might be able to help answer some of your questions. I only have an 8 week old myself, but I have many family members and friends who have done BW so I may be able to offer some advice…1) When my 8 week old was waking 3-4 hours after his 10pm dreamfeed, we started offering him the binky under the assumption he could go longer before eating. After 3-4 nights of holding him off with the binky a few hours, he stopped waking up at 2am and started sleeping until 4am. Here is our feeding schedule:7, 10, 1, 4, 7 (down for bed), 10pm dreamfeed, 4am night feed (which we are working on eliminating currently). If he wakes before 4AM, we binky him.2) I try to do just do one outing a day, so he doesn't spend more than 1 feeding or 2 naps on the go. For example, I will feed him, give him so wake time and then hop into the car for his nap. If I'm gone long enough to need to feed him again, I feed him on the go, and then he takes his next nap on the go as well. Once we get home, he naps in the crib again. I try to limit the 2 naps on the road if I can to just 1. I like that he is flexible enough to nap on the go, but also knows that when he's at home, he naps in his crib (mostly). But yes- you may be going less places during this season (especially right now as you are re-setting a schedule).Also, we struggle with appropriate wake times. My 8 week old seems to want to be awake a little longer than most, so I just watch him for sleep cues like a hawk and put him down as soon as they start to appear. I've got him pegged now: 2 yawns before he starts to fuss. Boom – nap time!3) My boy isnt' the best napper when we're at home. In a 3 hour cycle, sometimes he'll be awake for an hour and half (including feeding), then I'll put him down to sleep for an 1 hour and half and he'll fuss/cry through a lot of it. Finally, 30 minutes before it's time to feed him again he'll fall asleep – hard. When he does that, I left him sleep a total of 45 minutes, which makes us 15 minutes late for the next feeding. I figure, if he's starving he'll wake. If not, he'll appreciate the sleep. But I do try to keep it within a 1/2 hour of the normal feeding time. It can seem overwhelming, but hang in there! Focus on the eat, play, sleep pattern if you've been feeding on demand. Focus on learning her sleep cues. Lastly, if you know she's capable of something, gently nudge her in that direction.Let me know if you want to hash out more. I'm not "expert", but sometimes just putting two heads together helps things. Good luck! Wonder Weeks and growth spurts make it really hard on the schedule sometimes.I would test cry it out to your comfort level. We tried CIO last week and it was going well. I then had to have a minor surgery and that disrupted the process. But, because he sleeps well at night we aren't too eager to jump back into CIO. His naps are tolerable for me, and he's getting enough sleep. We let him CIO when he's whining, but if he's doing full scale cry fit we go in and help sooth him because at that point he's clearly not putting himself back to sleep. Soothing him looks like anything from sitting next to his crib and patting his tummy to actually moving him out into the swing for the rest of his hap. He only does full-scale cries every few days, not every day. There are lots of opinions on CIO so test the water and see what works well for you and your baby girl :)As for as the binky, our little guy sometimes wont take it…then we let him cry (sometimes really hard) for 5-10 minutes, and then he will take it. Weird. He also only likes the carseat if the car is in motion, otherwise, no go. Thus, I've taken to putting him a Moby wrap when we're out and about. I hated the moby wrap at first, now it's my go-to! Anna – have you tried bringing back the dream feed at around 10pm (or really, anywhere between 10 and 11pm)? Also, I know in BW it says one way to correct the 1-2AM wake up is to wake them up prior to that and offer a feeding. Wake them up a few minutes early each night to slowly back that feed up into the 10-11pm feeding over a few weeks. I bet a dream feed would work for you though, to at least prevent the middle of the night feeding.BW says to always treat a sleep issue as a food issue, on first assessment. If you don't think anything else is waking up your child (barking dog, light, etc), then it probably is a food issue (meaning…the baby is hungry!). My little guy consistently wakes up at 5:30 to eat, and his wake time is 7. Total pain! At first he would take a full feeding at 5:30 and again at 7, so I was ok with both because clearly he wanted/needed both. Now, I've started offering him less at the 5:30 feeding, work towards weaning off of that one.Remind yourself: your baby wants to sleep! As much as you want them to sleep, they want to sleep to. But – being babies, stuff gets in the way (like hunger). Although it sometimes feels like we are against them, we really are on the same team as them…helping them get what they need so they can sleep – which is what everyone wants! Thanks for the quick feedback Stephanie! I will try that for a few nights and report back. I have been pumping around 10:30p so he can have a nursing plus a full bottle each night before bed (which he takes no problem! ), so that's why we eliminated the dreamfeed…plus he seemed to be fine waiting till the next feed until 2ish. If we bring back the DF that will eliminate that bottle before bed each night, but I'm willing to try anything! Last night he fed at 2a then up again at 5 (yippee!) but luckily wasn't really crying until about 6, so I felt like that was an improvement. We'll try the DF for the next few nights and see what happens! Thanks! I'm no expert! I just know that BW suggests that you don't eliminate the dream feed until after the baby is successfully sleeping through the night until the desired wake time. Our 12 week old is completely asleep for his dream feed, and I know that if we didn't wake him up for it he would sleep right through it…only to wake at 1-2 AM. So even though it appears as if he doesn't want that feeding, we know it's critical to him working toward sleeping through the night. Good luck! Hi! I am really hoping you can help me. My almost 7 month old son had been a great nighttime sleeper until about a month ago. He always slept 12 hours…8pm-8am at first then it gradually shifted to 8pm-7am. Right around when he turn 6 months he started waking around 5 or 6 am (cant remember now). I thought he might be teething so i gave him some tylenol. He went back to sleep both nights. About a week passed with no issues then he started waking early again. I started feeding him more solids and dropped his third nap. Ive been playing around with his bedtime but whether i put him to bed at 7, 7:30, or 8, he still wakes after 10 hours. My other kids always slept exactly 12, so i assumed he would too. His first nap needs to be at 9:15 so it fits around my kids' school schedules. When he gets up so early, he cant make it till then or diesnt nap well. He is content with me holding him that early and waiting to eat. Although in sure he'd feed too, but im trying not ti get into a habit if feeding him so early each morning. The couple times ive rocked him back to sleep, he slept an extra half hour-45 min. I have also let him cry it out which he eventually (45-1hr later!) falls back to sleep for another 30-45 min. Is there a way to get him to sleep completely through the night again? i appreciate any help!!! Hello! Thank you for all the help, advice & support on Babywise!I have a 7 week old that just recently started making it to 5ish am before wanting to eat. What I'm having trouble with is getting him back to sleep after this. I have the same problem with him after the dream feed and when he would wake around 3:30 am. I'm glad that he does the eat/play/sleep routine during the day, but how do I help him NOT do that at night? I put him down and he'll just cry/fuss until I get him & still not sleep with my help. I don't want him sleeping all morning because he is so tired from the night, which is what has been happening. Any advice would be helpful – thanks! HELP!!! My 11 week old boy is still not sleeping through the night. I have been doing baby wise method for about three weeks now as far as the feed wake sleep cycle goes. He has pretty much been on a every three hour feeding schedule since he was born. Is schedule is such6:30 9:3012:303:306:008:3010:30-11At his 10:30 late evening feeding I can hardly get him to eat. I am lucky if I get 10 mins on one breast. He usually wakes around 3 am but some nights are earlier or later. Some nights he wakes twice. I try giving him a pacifier and this usually works if he wakes up a few hours after his late evening feed. However is the early morning feed I am concerned about. Should I let him CIO or should I feed him since he didn't get a full feeding at his late evening time. The past three nights I have been trying to wean him of this early morning feed but He just doesn't seem to want to start STTN.I am okay with trying the CIO method as long as it's the right thing to do. I just want to make sure he is getting enough to eat go meet his needs. All ADVICE is greatly appreciate! Also he was born 4weeks early if this matters any. He doesn't have any weight gaining issues. Weighs about 12lbs currently. Hi, thank u so much for ur blog. It has been a life saver for me- my go to when I am about to pull my hair out. Ok, so my 3 month old, Chase, has been doing ok with sleep- but I am still getting up with him anywhere between 3:30 and 5:30. Our desired wake time is 6:30. He eats on a 3 hour schedule. He will not dream feed well- if I do a dream feed he wakes up way more than if I just let him sleep. So right now we do 6:30, 9:30, 12:30, 3:30 and 6:30- and then that feed in wee hours. I formula feed him and I have tried weaning his ounces down and right now we are stuck at 3 oz. if he gets anything less than that he screams. Right now, CIO is not an option for that time because he wakes my daughter up. I don't know where else I can add that extra 3 oz during the day so he gets enough so he doesn't need them in the middle of the night. What do u suggest? Hi Mimi, I would guess it is because of hunger. She is likely having a growth spurt. I would feed her, but if continues on for more than a week, consider possible other causes. Hi! This is a question for Valerie or Anna Banana (since she also dealt with this issue)or anyone! I have a 5 month old–waking every day at 5am for a month now. I give him a feed right then and put him back down after a quick rock. He then wakes after 15 minutes and cries. He won't stop crying and it turns into CIO until 7 (or until I pick him up) and he is then too tired to hit his 9am nap. SO-What do we do when he won't sleep after treating the 5am wake as a night feed? THANK YOU!! Do you think it could be too cold or hot? Or maybe needs to be burped? Or maybe the diaper is so wet it is bugging your babe? I might try a night diaper or a diaper the size bigger than your child needs in the day. Hi Valerie! Boy, I think I have a tough case for you (or maybe I just never get it right). So little guy is still waking between 6-6:45 EVERY MORNING. He is now just over 6 months old. I had just accepted it, but then this morning he woke at 5:45 and I've hit the end of my rope. This is what I've done: 1) we started solids which for 2 heavenly weeks fixed his naps and caused a perfect 4 hour schedule and it also dropped his wake-up time to 6:45, which was tolerable, 2) he got put in a bigger diaper for nighttime, 3) then he starting waking 45 mins into the morning nap–never going back down. Then the same thing happened to every nap accept the final "catnap". So, I thought perhaps I was keeping him up too long (2 hrs) and I pulled his waketime back to 1.5 hrs. This obviously gave him an earlier bedtime and it allowed him (somehow) to get that good 2hr afternoon nap again. But it didn't fix the morning nap and it hasn't fixed the 5:45am issue. Extra things that may be important for you to know: I still EBF plus solids, he now has 2 front teeth, he still takes the paci to go down to nap, when he goes down I have to sing to him, he's drowsy and as soon as he hits the sheet he's out (so, no crying). What do you think? Thank you for your incredible work!! Can he put the paci back in himself when it comes out? I'm just thinking–could the issue be that he needs a dreamfeed again? Or perhaps heavier calories in the solids? 🙂 Yes, he can–but he doesn't. Sometimes its because he can't find it, other times its just because he's wailing. Valerie- I just wanted to give you an update on my 5-6am waking issue. Our little guy has now started waking up in the 5 o'clock hour. BUT- for the first time I have been able to give him a short feed (one breast) and he falls asleep until 7. He would never sleep after eating before, so this is an improvement! I suppose this means that he doesn't seem to be able to go longer than 9-10 hours without waking hungry. Does that sound acceptable to you for a 6.5 month old? thanks for your incredible advice! Yes that is fine. Some babies will be at that point still-especially babies. As he eats more solids, there is a good chance he will sleep longer, but don't force the solids in. My 4.5 mo old recently started sleeping in a stretch of 10hrs at night but has been for the last week waking up at 5am. I started by just offering 2 oz of formula, he normally takes 5-6 per feeding during the day, but for the past week after the 2 oz he fusses and rolls around in his bed for almost an hour. Any ideas to get him to go to sleep more quickly after this feeding? Should I be offering more formula at this 5am feeding? I don't want to ruin his first feeding at 7:30 and I'm scared to take steps backwards by offering more formula than I already have been. My plan was to wean him down to an ounce after a few days but it seems to be a little harder than I thought. Try giving him a full feeding and see what he does after that. If he sleeps well, you know he was waking from hunger. You would want to try to get that extra milk in him in the day instead of night if he will do it. Hi Valerie- I have an additional update and (unfortunately) a new conundrum. The little guy has begun to wake closer to 6am (instead of closer to 5am) and I still give him one side to nurse and then put him back down. He no longer sleeps afterwards but spends the next 30 minutes talking/playing! Finally he cries, my husband distracts him for another 20 minutes and then I give him the full morning feed. The problem: HE THEN FALLS ASLEEP nursing, every time. I know this isn't good, but the interesting thing is because he does dose off, he can later stay up longer and actually makes it to his first nap which starts at 9. Am I heading towards trouble or is this ok? I would not continue it. I would try giving him a full feed at 6 and see if he will go right to sleep at that time.Something to keep in mind is if you live in an area that does time change, you have about 6 weeks until what is ow 6 will be 5 am. Valerie-Thanks so much for your advice! I have been doing the full feed instead and it does seem to be working–he has gone back to sleep and wakes at 7:30!! Thank you again for your blog. I know you hear it all the time–but really, babywise moms cannot live without your blog! I tell everyone I know about it. You are so generous to keep doing this. God bless you! You are so welcome! Thanks for the update and for the thanks! Hi Valerie,My son is 10 weeks old and has recently dropped the 3am feeding and is now sleeping from the dream feed, 10pm till 530am, 6am. I've always given him less during the dream feed, about 3 ounces instead of 4 plus ounces during the day. Should I increase his dream feed to the normal daytime feed or should I just give him a smaller snack feed at 5 to 6am? I wasn't sure which step I should take first. If i feed him a full feed at 5am, 6am, he can sleep for another 3 to 4 hours. I would go for a full feed at the dreamfeed first. Valerie- after you have offered the full feeding at 5:30am for a while, how do you break the baby's habit of desiring to breastfeed then? (Can he really be hungry at that time for months and months?) Do you have any tips? It can become habitual. What I did was slowly decrease the amount of time the baby nursed. Then I got to where it was just feeding one side. Then I decreased that. And then the baby just stopped waking for it. You could also do CIO. What do you do (in any of these situations) if the baby just won't "go back down" after feeding, but it's clearly too early to be awake for the day? My LO had a full feeding, and wouldn't go back to sleep, not matter what I tried. Cried and cried. This is after going to bed at 10pm, so she definitely wasn't ready to be up for the day at 5am. If her bedtime was 10 pm, your answer is probably that she needs an earlier bedtime. I would put her to bed more between 7-8. Then do a dreamfeed in the 10 pm hour. Going to bed late will make children wake earlier in the morning. My 12wk old daughter is on an 8-8 schedule eating every four hours during the day. After 8pm, she wakes around 1-2am and eats another 6 ounces. But then she's up again 2-3 hours later. We've gotten rid of this second of the two night feeds, but she is still waking up at the old feed time (4-5am) and often won't go back to sleep. I'm pretty sure she's not actually hungry – when we used to feed her at that time, she'd barely eat at 8am. She easily makes up the extra ounces from the 4am feed at 8am now. Trying to shush or pat her in the crib, give her the pacifier, does basically nothing – her crying always just returns 10 minutes later and escalates. We end up taking her back to bed with us or rocking her to sleep. Even this usually only gets her back to sleep for another hour at most and then she's up again. It's been a week without the feed, and it seems like we're not making any progress. Should I just let her cry until 8am wake up? I would say she actually is hungry at that second night feed. If a baby won't go back to sleep in a night or won't stay asleep past the next sleep cycle (46-60 minutes), they are hungry. Have you tried a dreamfeed? I think it might help if you can get an extra day feed in there–so add a feeding, cluster feed, or do a dreamfeed. Good luck! I have a little one that will be 4 months next week and I'm at a loss as to what to do with him. Around 8-11 weeks he slept 8-10 hours at night then he stopped. He started waking up at all times at night mostly just once. So I would feed him. It was never consistant and I thought he was probably going through a growth spurt. Also at this time he started to only nurse for 5-10 mins total but he was happy and content inbetween feedings and would nap fine so I went with it. Now here we are weeks later and he still won't sleep though the night and he's 16weeks old. He now wakes up anywhere from 3:30-5:30 (still not really consistant with the same time every morning) and wants to take a full feeding I try to only let him eat for a few minutes to try to wean him and he will scream and scream til I feed him more. But then he isn't hungry for his 7:30 am feeding. I usually have to wake him up or he will sleep for another hour. Not really sure what to do?? Any suggestions? I give him a dream feed anywhere from 10:30-11, we are on a 3-3.5 hr schedule. He's the most happy and content baby during the day but man this night time stuff is throwing me for a loop. Hi Kim, there is a good chance you are having some different issues. It may have started with a growth spurt. You are now in wonder week 19 age range. I would feed him in the night when he wakes since he won't sleep otherwise. Then let him sleep until 8 am to start your day and see how he does. Do you think it is day/night confusion? I have posts on that. Are you waking her for that feed? If so, I would just let her wake on her own. I don't think its day/night confusion and I let her wake for that feed. Also she doesn't seem to be able to go past 3-4hours a night sleeping and she's 6 weeks old yesterday. Will they eventually extend night sleep or should I give her pacy or CIO to see if she can go longer? She will be 7 weeks Monday. We extended her waktetime (start of feed awake until she falls asleep) to 65 minutes and she's asleep within 5 minutes and sleeps for about 1 hr 50 min. It has seemed to fix her staying awake at 3 am. She now goes back to sleep pretty quickly. My question now is how come she doesn't sleep closer to the 6-7hrs night like she should be doing now? She only goes 4-4.5hr stretch at night. Her morning wake times are consistent. She's up within a 15 minute window. Is there anything we can do to help extend this night sleep? I've tried a pacifier with no luck. She is barely at the low age range of sleeping 7-8 hours at night. That is typically 7-8 weeks. And there are babies who are older. It shoulds like things are improving. I would stick with it and give her time. My 12 week old is waking every night around 4:45 or 5. She was consistently sleeping through the night until about 7 or 7:30 every morning until about a week ago. I dropped her dream feed to see if this was it but that didn't help. I then bought a bigger swaddle because I noticed every time she woke, she was unswaddled (hers was getting too small). That didn't help either. I don't want to make a habit of feeding her in the night again if she really isn't hungry. Do you think she really could be hungry? I have tried just rocking her back to sleep but she never really relaxes enough until I nurse her. What should I do? I forgot to mention we are currently on a 3 hour schedule that starts around 7 or 7:30 every day. She was having a dream feed at 10 every night, and then I had moved it to 9:30 then a little earlier before I dropped it. She started waking at this early morning time before I actually dropped this dream feed. I just wanted to see if feeding her for her dream feed was disturbing her sleep somehow because she hardly ate anything when I would nurse her. It could be a growth spurt. But I would wonder if she needs the dreamfeed back at 10?I would also wonder about being too cold at night. Hi Valerie,Thank you so much for your blog! I have always been able to find answers to my questions here. Now I have an issue that I need to ask you about:My son is 7.5 months old and has been sleeping from 7pm to 6am since he was 3 months old. However, for the past several weeks, he has been waking up around 5am. He wakes up happy and playing and I have just been leaving him in his crib until 6am for his first feed of the day, thinking that he is just in that 5am wake-up phase and soon he will start sleeping til 6am again… But no, it's been more than a month now and it's throwing off his whole day (plus I am then awake from 5am onwards…). I have also tried putting him in bed later at night but that does not work. He feeds at 6am, 9.30am, 1.30pm and 6pm. Should I feed him at 5am when he wakes up and treat it as a night feed, putting him straight back to bed? And then choose a new "start time" because 6am then won't work anymore? And then I will have to do 5 feeds in the day instead of 4?Any advice will be much appreciated! I wouldn't start feeding at 5 am unless you are positive he is waking out of hunger. Have you looked at the 5-8 month sleep disruptions post? It has a list of common reasons for poor sleep in this age. Are you feeding solids? Hi Valerie,Yes he has been on solids for 3 months now. I don't think he wakes from hunger because he is happy until it gets close to 6am when it's time for his first feed.I looked at the 5-8 month sleep disruption post and the only one that makes sense for him could be that I need to drop a nap. He takes 3 naps now and each is between 1.25 and 1.5 hours long. So I would like to change it to 2 naps of 2 hours each. Could this help with the 5am wakings? What do I do if my morning wake up window is between 730 and 8 AM and the baby wakes up at 630 some days and 8 AM others. If I feed at 630 for just five minutes even – and then feed again at 8 AM she isnt that hungry. She does eat some and then makes it to her 11 AM feeding though. Is there something I am missing here? I am willing to adjust my expectations to between 7 and 730 AM for final wake up. But I don't want a baby that wakes in the 6 AM hour in the long run. Erin, that is very normal. I would take the 8 am days and on the 6:30 days do as you are doing. She will get there. It is totally normal for her to some days sleep later and others wake earlier. Hang in there! Thank you Valerie! I just LOVE this website resource you've put together! It has helped me so much. The night weaning from the 5-6 AM post helped me get my daughter sleeping 7-8 hrs at night finally. She's my third and hardest one to sleep train for some reason. One more quick question – what if she is waking much closer to my morning wake up time window. So say the window is 730 AM – 8 AM. And some days she wakes in it. But many she wakes in the 7-730 AM window. Should I change the window then? Cause wean feeding doesn't really work there cause its so close. Wasn't sure what to do. Today we fed at 715 anyway and then adjusted a bit the rest of the day to get back on schedule by the 730 PM feeding. Erin, I would probably just call it close enough and start the day. I would consider moving the window of that works for you. If you really need the feeding later with the older kids' schedules, I would try a swing and see if she will doze off for another 30 minutes. Valerie,My first baby is 12 weeks now. She dropped the middle of the night feeding at 3.5 weeks, and then was consistently waking at 3:00/3:30 in the morning for the middle of the night feeding. At about 8 weeks she really starting eating less and less during that feeding, until about feeding for 4 minutes (breastfed) on only 1 side. Then she would wake at 6:45/7:00 and repeat that same small amount feeding. I figured that this meant it was time to drop the middle of the night feeding. I tried soothing her with a pacifier when she woke up at 4 which worked for awhile, but now she is in her own room and I am constantly getting up to put it back in 🙁 I have tried having her cry it out, but it doesn't seem to be working, and I don't know if I can keep doing it. I'm wondering if she is getting too many naps during the day, or going to bed to late at night. She eats at 7:00, 10:00, 12:30, 3:30, 6:00, 8:30, and a DF at 11:00. She goes down for a nap at about 8:00, 11:00, 1:30, 5:00, and then goes to bed for the night at 9:30. (We wake her up to DF at 11:00.) So she is getting two 2-hour naps and two 1.5 naps during the day. Do I need to keep her up longer so she sleeps better at night, or do I need to put her to sleep right after the 8:30 feeding, or both? I'm really at a loss of what to do, because I really feel she is not hungry in the middle of the night she is just waking up. Please help!! Hello! My baby is 5 weeks old and has been waking at 5, getting a full feeding (at least I think it is…he is wide awake the whole time), and then waking again at 6/:15. He doesn't eat as much at the 6 feed, but is wide awake. Suggestions? We are currently on a 2.5-3 hr schedule and I would like his wake time to be 7/:30. Thank you!!! Hi Valerie,I need some help with my 5mo. He started sleeping through from 7pm to 6-7am with a dreamfeed at 10:30pm at 4mo, 1 week. We started a little bit of solids around then too. So if he woke at 5-5:30, I would breastfeed (full) and put back to sleep & wake him at 7, but at 6am it's not possible. So I try to delay feeding till 6:45 since DWT is 7am. Sometimes we are successful, sometimes I need to grab him at 6:20. If I feed at 5/6, he doesn't eat at 7am. We have two issues:-1. inconsistent start time (unless you count leaving him in bed till 6:45-7am everyday as consistent)2. Morning nap is hard-I don't know when to put him down. His first wake time used to be 1hr 10mins. Now he goes to sleep if I put him down at 1hr 15-30mins but sometimes wakes after 45mins crying & wont resettle. If I try later he tosses his head, cries then finally falls sleeps after an hour to wake 45m-60m (Overtired?!) He used to do 2.5-3hrs long sleeps before, this dropped to 1hr 45m for the first nap shortly before he started sttn. We know the WT for his second and third naps is 1.5-2hrs depending on how long he slept before and where we are as he doesn't sleep on the go.Any advice please? Please help! I tried the Google group and had some great support, but we are still struggling with the same issues for more than 3 weeks now. I need my angel baby back in the day-the fussy overtired child makes me dread my days (I also have a 3yo at home for school holidays ATM). For example-Today was a typical day. He woke up at 6:30, I got him & nursed at 6:45 (first feeding, full). He showed sleepy eyes at 7:40 but I thought it was too early & I wanted to give him some solids. I do quickly, burp him & put him down at 7:53. He was quiet but tossed his head back & forth (self soothing as still being swaddled lol) till 8:25 then woke after 40mins! Do you think that mean he needs more awake time or less? Do I calculate WT from 6:30am when he woke up or 6:45 when we got him out of bed? ?Another example-Last Saturday he made it to 7am! We were so happy-I saw slow eye blinks and staring at 8:15am so I finished feeding solids & packed him off at 8:26am. He proceeded to protest then cry till 9:30 (we went in to soothe once at 9:25) and slept 97mins till 11am. Then that afternoon I put him down at 12:20 thinking he was up too long before napping before & he was nuzzling but he screamed till 1:30 then napped 40m till 2:15. My husband noticed sleepy eyes and put him back down at 3:05 & he yelled till 4 whereupon he took a 40min nap. That was one nightmarish day & I felt so bad for the little guy. Maybe we need to discount his cues & just go by wake times?He was such a great napper before the fourth wonder week! Please help I really need a new routine. Ps: he's on a 4-hr schedule (7,11,3,6:30, df at 10:30, bedtime 7pm & chosen DWT 7am. would love to know the solution to sherris question too! I have a 5 month old boy going through something similar! Thank you for this wonderful blog!! Janessa, thanks for the suggestions! Today he woke at 6:30 so by 8 he was back in bed and up after 1hr 56mins. So that's 10am. I wait an hour to nurse so obviously he can't have solids because he needs another nap by the time we finish and get diaper changed. Then wakes after an hour forty five mins at 1:30. So that's too early for impending third nap-put him down late at 3:45. He self settled quietly but wakes by 4:30 when bedtime is 7. Grrr! Fussy baby.I'll try to work up to 3 Meals a day. I agree it'll go a long way toward sleeping till 7am. I will ease df out when he has 3 meals consistently because I still think he needs the milk. I don't want to add in the 5/5:30 feed because that's dinner time for both kids. So far I can feed him breakfast and dinner. So as an update he's been eating three meals and mostly loving it but has become quite constipated. Poor little tyke! We are trying more fruit sauce & prune water and less cereal. The past two nights he has woken up at 2:30-3am and cooed for 30mins before going back to sleep without needing any intervention. Did your child do that? Then woken about 7, which is nice but his naps have consistently been less than 2hrs. I think it's also overtiredness. I calculated yesterday he slept 11.5hrs at night and only 3.5 in the day which is 15. I wouldn't mind except today it's even less and he's not happy because he's tired. We will keep working on the solids for now. And I know this is a bit of the wrong post area but at 5mo WT should still be about 1.5 to 1.75hrs correct? Sherri it sounds like he needs a shorter waketime in the morning. Waketime can vary considerably for this age group. Remember the first waketime of each day is the shortest of the day. It might even be just one hour. I would really focus on getting that right. Calculating, I would probably count the time in bed as half time. So if he is up for 10 minutes, count it as five. Although if he is up crying for ten minutes, it might need to be counted as ten minutes. Crying is more exhausting than laying happily. Hey… so thankful for the time and effort you put into this blog – thank you!! I have a desired wake time of 7am – this worked beautifully when my 3 month old was waking up still at 2/3am for a feed – however now that she's extending her nights she now wakes up at 6am – I can usually hold her out until 6:30am with a pacifier. I don't know whether to just keep feeding her at 6:30am (which is within half hour of my goal wake time) or treat that 6am wake up like a night feed and then make her wake time 8am (which isn't what I want her wake time to be – the goal is 7am!) Advice? Val, we conducted an experiment today. He woke up at 6:30 and was happy to wait till 7. I nursed, fed solids then put him back to bed at 7:50 (assuming 6:30-7 is 15m WT). He proceeds to toss his head and quietly try to sleep for 30mimutes. I think he finally fell asleep at about 8:25am then naps 45m again. Considering he wasn't screaming does that mean he needs more WT or less? And if so do I try 7:30? This is getting a little crazy. Sherri, if it were me, I would go back to the last time that worked, so one hour. Then from there, I would add five minutes at a time until I found the right time. Often the first waketime is much shorter than others in the day. Make sure you keep notes of what you do and what the results are. Do not rely on your memory. Bek–my advice is really all in this post 🙂 there isn't a right way to do it. Just choose one of the strategies I listed and see how you like it and how it works for your baby. Good luck! Thanks Valerie! I've been logging it but the results have been confusing because his first wake up kept varying. With blackout curtains he has been sleeping till we woke him at 7am so now I can properly experiment. If I put him down at 8:15 & he takes 15mins with some chattering to go to sleep then naps 40-52mins do I count it as a good nap? I'm inclined to say no even though he settled without screaming because he woke up tired & fussy till the next sleep but won't resettle.Almost at the point where I just want to do Btc 9am & 1pm. Do you think it's possible in a month or two or just asking for trouble? He's 5.5mo. I remember my first son doing 9am & 1pm & 4:30 naps (2+2+0.5hrs) at 6mo-he may have screamed at times beforehand but he'd stay down for a good 2hrs! Hi Ladies (Valerie and Jenessa) here's an update! We have found his WT is 1hr 45mins-2hrs now that he's 6.5mo. Any shorter and he catnaps. However we are in a bind. With or without a df he wakes at 5am or even earlier now. He's not interested in the 10:30pm dreamfeed, drinks half or refuses outright or gets mad. Without it he has started waking earlier 6+ has turned to 5am/4:30am/ yesterday 1 & 3am!! I tried with the df to offer one breast or delay feeding to no avail-still consistently 5am! So if he can go some nights without a df for 10-11hrs and has the above signs do I try to reintroduce the df and let him CIO at 5am? I don't think he's hungry because he's happy to eat at 3am but not ravenous. We can't go back to those awful motn feeds. Please help. His feed routine is 7,11,3,6:30. Naps are about 1.75-2hrs after waking and solids thrice a day come 15-60m after milk depending on if I woke too early and is due for another nap. There's no EWS except for the first cycle now, it's mostly Wake-eat-sleep but he doesn't nurse to sleep. He could also be transitioning to two naps. My 5.5 month old used to be a great nighttime sleeper until about a month ago we went that through a brief sleep regression. She no longer wakes at night, but still has early morning waking. She wakes anywhere from 5-6:15 (however usually before 6) and our ideal wake time is 6:30-6:45. Since this has begun we moved to a 4 hour schedule and dropped the 4th nap which hasn't seemed to make a difference. We've tried different bedtimes (between 7-7:40) with no big change. We've tried some CIO and leaving her in her crib until desired wake time. No help. Also she wakes up crying now instead of happy like she did before. I would love to get back to our original wake time, but not sure what else to do to fix it! Any help would be greatly appreciated. Hi! This is my third BW baby. My first two girls were textbook BW, STTN at 6 and 7 weeks. My third child a boy has been much more challenging! He will be 12 weeks old this week and is not STTN. He still wakes between 11-1 and then again usually around 3-4. His schedule is 730,1030,130,430,730. I stopped the DF a while back because it seemed like he was waking more frequently at night when I did it. His naps aren't consistent either. Sometimes he'll have 2 hrs uninterrupted naps other times (more frequently) he'll wake 45-60 min into nap (started at 7weeks) and have a very hard time falling back asleep. We either CIO or plug with paci, although he doesn't really like the paci and has recently found his thumb. I try to stay as consistent as possible when putting him down for naps but it can be challenging with my other kids schedule. I don't really know what to do now. I feel like we are miles away from STTN. He is a big boy. Over 15lbs last I checked. He was born 9.5lbs. Is EBF and is happy when he is awake! Any thoughts, suggestions would be greatly appreciated!!! Should I try the DF again and if so, what time? Hi! I need your help! My 4 month old is, for the most part, a great sleeper! Our goal is a 7pm bedtime and a 7am wake up time. We follow the eat/play/sleep routine and currently feed every 3-4 hours with 2 solid naps (1.5-2.5 hrs) and a third short nap (45 min) in the evening. She has no problems falling asleep. Doesn't use a pacifier. Is put down awake and can put herself back to sleep the majority of the time. The only exception is every morning between 4 and 6 am. She wakes up babbling and cooing. Rarely does she cry at this time. She wakes up almost ready for the day. We've left her to put herself back to sleep…sometimes she will and sometimes she won't. At times she will babble for up to 2 hours, at which point I go in and attempt to change her diaper and reswaddle, put her back down. Usually she will then be even more awake and sometimes cry. I try not to feed her until 6-630 if I have to, but this messes up our entire schedule for the rest of the day. should I treat this as a hunger problem?! She isn't crying, she just isn't sleeping! Help! Also, we dream feed around 10-1030. My son is 4.5 months old and is finally STTN from 7-430/5ish. I usually have to go in once around 2/3 to put in paci but he also goes right back to sleep. Now we are having the problem of him waking between 430-6am. Our desired WT is 7-730. The problem has become that I know he is hungry because he vigorously eats, but then he won't go back to sleep when I lay him down. I have tried CIO. I have tried feeding him on only one side (that worked once), I have tried putting him in the swing, bouncing/rocking, he just won't go back to sleep. He is my 3rd baby and definitely the most difficult as far as BW sleeping is concerned. I can't really compromise his wake time because I have to go off my two older kids schedules. So if he's off, his whole day is messed up (naps especially). Do you have any advice?? I'm loosing my mind! Valerie,I am a first time mom and have been trying BW since my son is 6 weeks. He currently is 10 weeks on August 23rd. I have a question regarding STTN. As many moms mentioned, some nights are good and some are bad. Sometimes he sleeps until 4,4:30, 5:00, 5:45, and even 6. I have read your blog on how to attack the 5-6AM wake up several times.I am curious concerned though about two things: Should wake up time be later than 6am? Most people start at 7AM. Is it ok if I don't? I wasn't sure if there was a reason. Also, I am concerned and almost developed anxiety that we haven't completed the merge yet. It said between weeks 7-10. Well if we hit it at 12 weeks, how do I know when I need to adjust the schedule and drop the feed all together? Is it ok if we don't drop a feed until week 12 and also adjust the schedule then? I am concerned I am messing him up. How many nights in a row does he need to be STTN to know this? Also, what technically counts sleeping through the night? Is it sleeping until designated wake time and not waking up or is it a certain amount of hours a night? Please HELP! Hi Valerie – so my 7-8 week old has been kind of doing this, except not exactly. Her eyes are still closed, and she seems to be asleep, but she whines and does a high pitched "cry" (not her actual cry, like an asleep cry), and does this off and on: maybe every 5-20 min. Any advice? She's not actually awake yet, but after an hour of this cry/moaning she eventually wakes up. She acts like she wants a dreamfeed or something. Hi there, My daughter is currently 12 weeks old, and we have been following BW (as it worked perfectly for our oldest daughter who was STTN by 6 weeks). Unfortunately, we have hit a bump in the road w/ our second. She's on a 3 hr schedule, and naps pretty well, so we don't think she's over tired. She has shown in the past she can make it from 10pm dream feed to 6:30/7am, however, the last two weeks we have entered this rut, of waking consistently at 5:20 every am. We have been trying to let it CIO some, but after 30 mins we usually give in (bc of our other daughter), and go in to soothe her. We have been good about not picking her up, and just patting her/using the paci, and she quickly does go back down and sleep until 7am, waking happily again. So we KNOW this isn't a feed issue. I'm torn how to get her to go back to sleep on her own and how to skip this 5am phase. It seems to be a bad habit. We tried one night just skipping the dream feed, and the same thing happened (she slept 8 hrs, then woke/needed soothed/slept down until 7am again-only difference is she woke up two hrs earlier, bc her last bottle was at 730, instead of 930pm). Not sure if we should just continue with the dream feed, until eventually these 5am wakings vanish. Or will they ever vanish?? HELP we never experienced this w/ our first daughter!!! Hi, I already posted a few questions about starting late but thought I would post my feeding questions under this blog (for reference my son is now 13 weeks old, we started BW two weeks ago with feed/play/sleep routine, napping in crib, and CIO now I’m working on getting the schedule consistent. We started on the schedule for 3-6 week olds because he still wakes once at night and he can’t sleep longer than 45 min for a nap.):1.) Does keeping your baby awake for a feed mean his eyes have to be open? Many times in the early morning or evening he will be nursing but with his eyes closed, is this ok?2.) Our feedings last longer than a half hour because I have to supplement my breast milk with formula so they can be 45-50 minutes including burping. I feel like this cuts into his playtime…his overall waketime is 75-90 minutes usually so when you take away the feeding it only leaves him 25-45 minutes of playtime. Is that ok? Any tips from others in this situation or implications I should consider? The schedule for his age looks to be on a 3 hour cycle which could accommodate this better but since I’m doing the schedule for a 3-6 week old and have 8 feedings to fit in it’s a bit more cramped. So far usually my first morning feed is a 3 hour cycle, then the rest of the day is 2.5, then the witching hour cycle is 2 hours. 3.) His middle of the night feeding is moving closer and closer to the first morning feed, at 7 am. The past few nights he woke at 4:45, 5, 5:30 etc. One night he woke at 5:30 and I let him settle himself back down and he slept until 6:30 so almost through the night. Is this a sign that he might soon drop that feed, or do I need to do something to adjust it, like wake him at 3am, because it’s getting too close to his 7 am first feed of the day? Hi Amy, 1-Eyes can be closed, just be sure they are just closed and baby is not taking a power nap.2-Yes playtime length is okay–that isn't too short. You might have him awake too long over all with feeding and playing. He should be awake total 60-90 minutes, including feeding time. 3-Yes he is moving close to dropping that feeding. I have a post titled "5-6 AM night wakings" that talks about that. Just wanted to follow up on my third question, which is really the one that is most related to this post (sorry the others are feeding related but not 5-6 am waking issues!) Last night my 13 week old woke again at 4:30, 5:10, 6 then finally 6:30. Each time I listened for a moment to see how hard he was crying, to try and tell if he was hungry or just woke up and trying to go back to sleep. Two times it was borderline, not really hard hungry crying but a little more than just cooing and mumbling. I wanted to err on the safe side so I decided to try to feed him but first I went to the bathroom and by the time I got to his crib he had fallen back asleep so I left him and went back to bed. For the last waking at 6:30 he quietly fussed/cooed/laid awake until I got him up at 7 for our normal start time. I don't think I exactly let him cry it out, more like fuss it out, since he was able to put himself back to sleep fairly quickly. But maybe since he repeatedly woke up he was hungry? My question is do you think this is ok/ does that mean he wasn't really hungry? Or should I feed him the first time he wakes up each night and just wait for the day when he sleeps through? I don't want to not feed him if he still needs that middle of the night meal but also know he needs to learn to self soothe. Thanks! My baby is 5 months old now and has never had a consistent wake time in the night. We follow a 3.5 hour schedule and go to bed at the same time every night. So sometimes he wakes around midnight, or 3 I’ll feed him he goes back to sleep. But without fail he wakes up at 5:30 and it’s a battle till 6:30 to keep him asleep! I’ve learned if I feed him then he won’t eat his first feeding for hours. What do I do?! I can’t get him to break this habit of waking at 5:30 for what seems is no reason and I refuse for that to be what time I start my day. Please help! I have a 2 month old who was STTN from DF to WT and then started waking at 5am again. Should I treat this as hunger even if I know he can go longer? Hes already taking 5.5-6oz of bottles breastmilk at each feeding so I don’t think he could handle larger bottles and with work I can’t physically do a cluster feed in the evening.